Leasing Costs Calculator - Real Property Metrics, Inc.
For the Commercial Investment Model, the Leasing Costs Calculator is used to calculate the average annual leasing costs based on the information you entered into the Rent Roll. Based on just a few inputs, it will determine the average costs for the current roll-over schedule, the 2nd generation leasing schedule, and the vacant lease-up. If you have any expected Capital Expenditures (roof, HVAC, etc.) in a given year you can enter them into the Capital Expenditures in the Cash Flows tab (cells F78:O78). 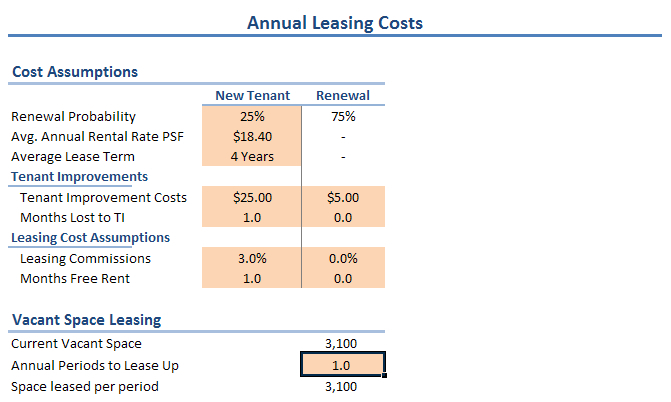 Note: The Leasing Cost Calculator is only available in the Commercial and Mixed-Use Investment Models.